While you may not have noticed yet, things are changing at Foundry and we are the middle of a process of restructuring and reorganisation. This will include bringing back some old ranges and reintrodcuing some old packs that were inexplicably removed from others. This will all take some time but we want to return to being the company we once were. As a symbol of this we have reintroduced the English Civil War and Thirty Years War ranges. Although some of these things will take some time to put into place, one immediate change we have made is to make sure that those ordering from outside of the UK will pay the same price as everybody else. It was a particularly bad policy that we have rectified as of today, no matter where you live in the world you will not pay more than our domestic customers. Watch out for further changes in the future. In my previous post, I mentioned that I was thinking about what FrDave had been doing with room keys for dungeon modules. I liked the way that he was breaking down the information in to separate chunks, but I think that it could go further. The room number and name are in the first row of the information box, then the dimensions of the space, with an orientation of the far wall. Special room shapes (i.e. circular) are mentioned here. Then information is presented about the room contents, and sensory information when needed. This information is sorted by "obviousness", so that what the PCs would first notice when opening the door is listed first, such as a coffin on a dais, or a slavering baboon rushing for them. The information is divided into three columns, the first being "Obvious", the second "Detail", and the third being for the DM's use. The column color shifts as well, to help you keep it straight when reading the text. For example a painted wooden chest is obvious, that it has a dwarf made brass padlock is detail (that the players would get during examination), and that the chest is trapped with a poison gas, and contains a jeweled skull worth 100gp is for the DM's eyes only. Anyway, nothing groundbreaking here, but it may be helpful when you are in the heat of the moment. Thoughts? Comments? Refinements? Have not been keeping up with the old blogosphere, so there is plenty of interesting work out there that I did not notice when it was new and fresh. Map Text Layout from FrDave. 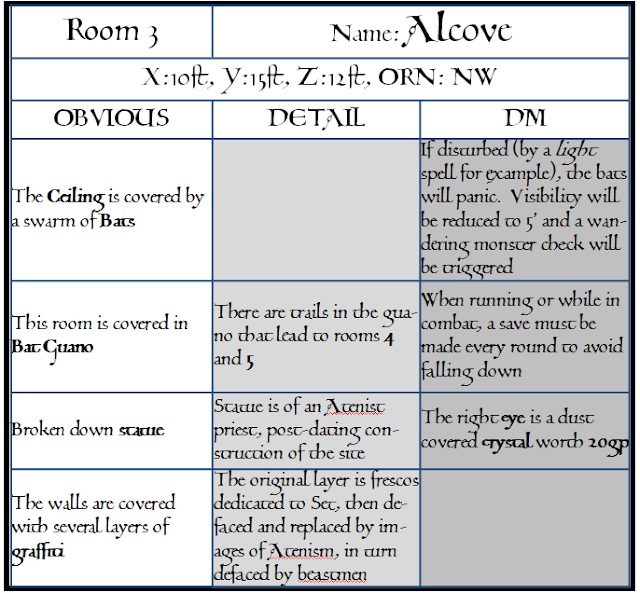 Where-in different columns are used to convey information to players and the DM respectively, and information rows are sorted by "obviousness". For example, a you might have basic room description as a player text box, and the size/secrets of the room as the DM. Monster physical description, and then monster stats, etc. There is definitely something there about organization that I want to look into more, and being spreadsheet/box oriented, this appeals to me. It seems to me that class based XP charts can be a fun addition to the game, particular in a more sandboxy setting, where you want the players to develop their own goals and plans. It may be important to try and structure the bonuses in such a way as to direct play in a positive way, where the party tries to work together, rather than against each other. I particularly like the idea of a pilgrimage XP bonus for cleric based classes. The Empire in the Warhammer world is set up as a pseudo-Holy Roman Empire in the late 1500's, and correspondingly its soldiers look like Landsknechts. Games Workshop has drifted away from this focus slightly in the last decade, and correspondingly my interest in the new units of the army has declined. Fortunately, I have enough troops to make a [sizable] army using the earlier 5th and 6th edition plastics, and do not need to resort to the newer pajama-men-with-poor-dental-work-and-bric-a-brac that now pass for proud soldiers of the Empire. Unfortunately, Landsknechts can be pretty hard to paint, as they had no "uniform" colors in the standard sense, and just went with whatever looked good, wore layered clothes with ribbon sleeves, and otherwise made it hard for the poor contemporary painter. Enter this Landsknecht painting guide that I found via link on TMP. Very useful that, and will be particularly useful for mercenary units and individual character figures that do not correspond to the Empire state armies.